You depend on your Honda to take you where you need to go, and our goal is to make sure it is there for you as long as you’d like to drive it. We pride ourselves on having the best customer service of any Marysville Honda service center and repair dealer; whether you need routine maintenance or a serious fix our team of experts are here to guide you to the right service for you and your vehicle. Our Marysville auto repair shop has served the Marysville and Everett communities and the rest of Snohomish County for over 30 years. We are centrally located in Marysville Washington, just two blocks from an I-5 on ramp which helps us to best serve our customers from Everett, Arlington, Snohomish, Monroe, Lake Steven and Lynnwood as well. All of the Repairs and Services You Need - with a warm welcome and a Smile! Our mechanics are ASE-certified by the National Institute for Automotive Service Excellence, and we use the latest technology and tools to maintain and repair all makes and models of Honda (Accord, Pilot, Civic, Avalanche, CR-V, Fit, Crosstour, CR-Z, HR-V Crossover, Insight Hybrid, and Odyssey). Our prices are competitive in the local market and we do all jobs as quickly and effectively as possible. Bud’s uses genuine Honda parts when available so your vehicle can stay with-in its warranty standards. 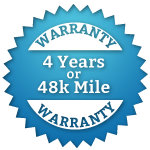 We are so confident in the quality of our work that we offer a 4-year/48,000-mile warranty for our Marysville Honda services and repairs. Contact Bud's Auto Repair and Transmission to find out what we can do for your Marysville Honda service and repair. We love our job of keeping Snohomish county residents safe and satisfied on the roads! Click here to schedule your repair or service online today!